Jim and Barb's RV Adventure: Going Crazy in Custer! Two words to describe this week….Rain and wind. 2 inches one day, 1 ½ the next follow by several days of scattered showers filled low-lying in water and the grass green and lush. No day was a total bust, in fact most of the days were very nice with storms popping up throughout the day and most of the nights. These three days were followed by several days of winds well into the high teens and 20's. Walking outside we would get pelted by sand and gravel.The green landscape combined with the clouds made for some spectacular scenery. See that rig across the valley from us? Well, Cindi and Roger are over visiting Jim and Brenda for the month so we have two more to our little community! Memorial Day was beautiful, rain in the forecast but much later in the day. Vicki and Harry came over bringing their dog Sadie and Buster along with a thick tri-tip steak and some macaroni salad. We were joined by Jim, Brenda and Cindi (Roger was working). We had a great time with many laughs, now that I think of it most of them were at my expense…. With the cistern pump up and running it was time to turn our attention to our neighbor’s prairie dog situation. The Jordan’s have not had any on their property for several weeks. We on the other hand have a little more of a challenge. With about ¼ mile of our property bordering hundreds of prairie dogs we have some invaders who don’t respect fences and no trespassing signs. Frustrated with this situation I called an emergency meeting (aka Happy Hour) of “The Dog Squad”, Barb and I along with Jim and Brenda sat down to brainstorm a solution (scary thought huh?) That came to two important conclusions: 1) Cold beer is good and 2) If we wanted them taken care of we would have to do it ourselves. Our next step was to come up with the best method to address the neighbor’s pests. We considered harsher no trespassing signs but ultimately came up with the following formula as a sure cure to this infestation: J²+B²=0 Prairie Dogs! We gathered the next morning at the fence line and faced our enemy. The prairie dogs across the fence on our neighbors 75 acres just laughed at us knowing they were safe on that side. When we opened the gate and drove our 4 wheelers through you should have seen the look on their faces! Over the next several days we pushed the frontline of our battle westward. We would make good progress each day but the dogs would take some of it back each day after we quit. Barb and I have a pretty good system of applying each hole and burying it and were going smoothly until I hear Barb yell “We’ve got a runner!” I turn to see a prairie dog sprinting east behind our frontline with Barb chasing it with a shovel over her head. (If you think I am making this up, you don’t know Barb very well.) The prairie dog was a little faster than Barb this time and made it to a well-hidden hole. Day by day we pushed the line all the way across the property and are happy to report that we have the first 35 acres under control, only 40 left! 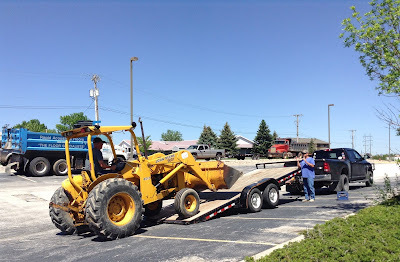 Another exciting event was the fact that Jim and Brenda found a tractor on an online auction that they wanted to bid on. Jim and I drove to Rapid City to inspect it. After driving it around and testing its components, we found the tractor sound and bid-worthy. Several hours after arriving home we received a text from Jim that said they won the auction and now own a tractor! The next day we drove back to Rapid to pick it up! Jim loading their new tractor! While perusing Facebook one evening I noticed a garage sale in Hot Springs that had several items that we just could not live without! So bright and early the next morning off to Hot Springs we went. What intrigued me was the construction material in many of the pictures. We left there with 2 Jeep loads of stuff. Wheel barrel, 2 ladders, 60 boxes of construction nails, and many other items. Good thing we have that shed, it is getting filled up! 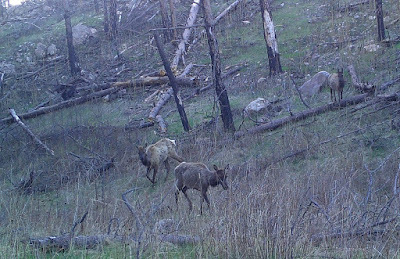 The trail cameras have been very active the past week with deer, turkey, elk and even a mountain lion! 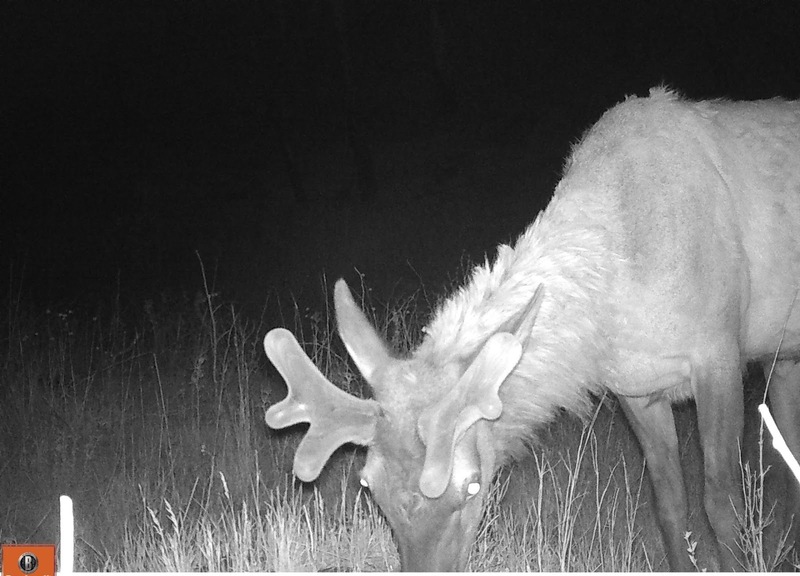 This guy will have a nice rack in the fall! Hard to tell but this is a mountain lion. Can you see his ears and hump on his back? Our last and final adventure of the week involved a 6¼ mile roundtrip hike up to the face of Crazy Horse. 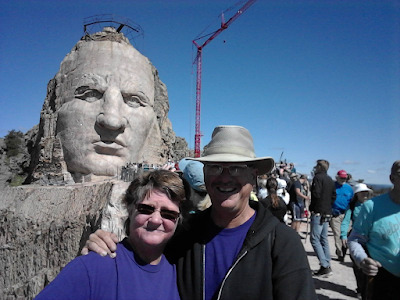 Known as a Volksmarch (People’s March) this bi-annual event allows you to walk right up the arm of Crazy Horse and see the construction up close and personal! As we started out on the hike it dawned on us it had been quite some time since we have been on a trail. At the first hill the group started to spread out, this is where the men were separated from the boys so to speak and we were passed by hikers well into their 70's and an old lady in a walker. I promptly pushed her over and we felt a lot better about ourselves. The trail wound through the forest where we caught glimpse of the monument now and then. We eventually got closer and closer getting views that you don't normally see from the visitors center. The machinery looks so small! About an hour after starting we were standing on the arm of Crazy Horse looking down at all the lemmings on the trail below us. It was very interesting how they are chiseling away at the mountain and how smooth the surface of the face is. On our way back down we ran into Jim, Brenda and Cindi who were on their way up. Overall I would say it was a moderate hike, most of the terrain was a slight grade intermixed with steeper grades. Definitely worth the time if you are in the are area when they are having this event. Last but not least is this weeks mini-rant...… Each month we watch our Verizon Jetpack usage trying not to go over our 15gig highspeed limit. Once we hit this limit we a throttled down to a snails pace speed. Although we usually go over our 15 gig it is not too bad as it happens at the end of our monthly cycle. This month we anxiously awaited May 29th which is the day our new cycle begins. Imagine our surprise when we turned on our Jetpack this morning and it read "10 gigs used"! How is it possible we used 75% or our monthly data in 3 days?!?! We don't watch videos, movies or shows and we turn it off whenever we are not using it.....Frustrating! Tomorrow starts four weeks of visitors and work as Kevin and Cheryl arrive followed by Farmer Bob and his wife Deanne, Dino and Lisa and my sister Carol! Let the fun begin! I like your battle planning and keeping track of your cycles is just good planning. You don't want an oops. We changed some settings on our iPads and phone so it does not update the Cloud, we will see if that makes any difference. We are so jealous of all you RV Dreamers that have continually met up again since we left Q! How nice of Jim to buy you a tractor. Sounds like you have a busy summer ahead with all the visitors. Enjoy your little piece of paradise! Now if I could just convince him that he needs a spotting scope! That is a sweet tractor with a serious bucket! That will get some work done at the Jordan place, for sure, Jim. They have been busy already with project using their new tractor, they are becoming quite the ranchers over there! Looks pretty sweet with all you sitting out at the new property. Love the trail cameras. 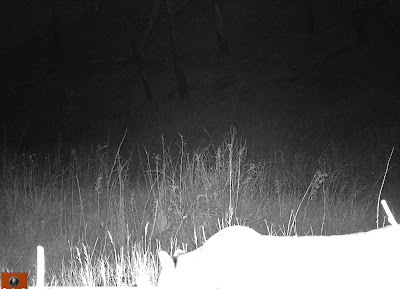 I'm not sure I would be thrilled with a mountain lion in the area. Watch those two cute dogs carefully:) By the way, which haven't made a nice appearance in a long while in the blog! I can just imagine Barb's frustration as one of those prairie dogs got away. Too bad you weren't filming it! Gee, we went up to the arm of Crazy Horse but our nice friends, Joan and Steve, took us in the van. Too bad you weren't there:) It is totally cool to be up there. Boy is that face ever huge! We were amazed at the detail of the monument once you got up close. It was a real special treat to hike up to the arm and see how they were doing construction. Funny, I can almost see you doing the happy dance as those pesky critters can certainly be frustrating! Sounds like your summer if off to a great start! Enjoy all your company! Should be a couple of fun weeks for sure! Love to read the blog. Funny stuff! Sounds as if y'all need to apply a bit of .223 Prairie Dog Remover to your problem! Oh, trust me, that is a little lead intermixed into the equation! Hope you're still winning the Prairie Dog War. We've used 10gigs in less than 4 days, I don't understand it either. Going over as we are on the hunt for volunteer position or have to plan out some travels. Time to Start a House Building Project!